Last week I attended an evening of talks given under the title “Extreme Weather and Floods” and hosted by the local sustainability group PAWS in the Thames side village of Pangbourne. The speakers were Professor Nigel Arnell, Director of the Walker Climate Institute, Reading University, and Stuart Clarke, Principal Engineer and the senior officer for flood risk management at West Berkshire Council. At the close of the Q&A at the end of the evening, the moderator encouraged the audience to mingle with the speakers and take the opportunity to ask any follow-up questions. I ambled up to Professor Arnell to ask for a pdf copy of his Powerpoint slides, but before I could get to him he was grabbed by a late middle-aged man who wanted to vent his frustrations on his treatment by his insurance company (I shall call him Mr. Angry, and don’t blame him). The insurer was now demanding a £1,400 (about $2,100) annual insurance premium for flood risk cover and a £15,000 (about $23,000) excess for flood damage (the home owner has to pay the first £15,000 of damages before the insurer steps in). Result? He declined and his house now goes uninsured. Flood insurance is a classic case of where climate change meets Mr. Market. At present, U.K. insurers have an agreement with the government known as the Statement of Principles on the Provision of Flood Insurance (a copy can be found at the Association of British Insurers here) that can be summarised as Mr Market Lite. The border line between capitalism ‘red in tooth and claw’ and the socialization of risk is a one-in-75 year flood event (a 1.3% chance of flooding in an individual year). If you are in a flood zone which is estimated to have a flood risk greater than one in 75 years and the government has no plan to beef up flood defences over the next 5 years, then ‘tough’—you have to make an accommodation with Mr. Market. If—like Mr. Angry of Pangbourne above—Mr. Market’s quote is in the stratosphere, then you may be forced to turn it down and go uninsured. Note that if your property was built after 1 January 2009, it automatically falls outside of this agreement between the insurers and the government. You can see the definitions of ‘low’, ‘moderate’ and ‘significant’ risk in the Environment Agency’s “Flooding in England: A National Assessment of Risk” here (click for larger image). There is a long standing link between the insurability and mortgageability of a property. Mortgage lenders offer a mortgage against the value of a property, normally with up to a 25 year contract to the borrower. It is a standard condition of all mortgages for the property to be covered by standard buildings insurance, including flood cover, for the full term of the contract, in order to protect the borrower and the lender. If insurance is not available, then it is unlikely that a property will be mortgageable. A particular concern would be if the ABI were so dissatisfied with the government response to flooding that their members decided to withdraw cover from existing properties. Insurance contracts are normally only valid for 12 months, and if insurers did not renew cover at the end of this period, it would leave both lender and borrower exposed to an increased risk of loss and potentially invalidate the mortgage. The desire to retain flooding cover as a standard aspect of buildings insurance is, therefore, extremely important to the working of the mortgage market and the wider housing market. Properties that could not get either insurance or a mortgage would be significantly devalued. 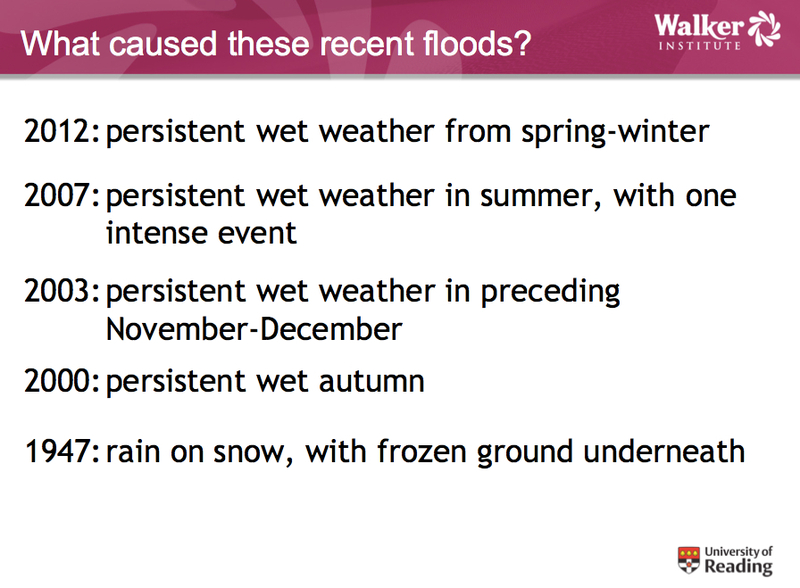 In short, a concentration of flooding events over the last 12 years. Nonetheless, Arnell also points out that clusters have happened before. The longest record of river flow is for Dorchester on Thames, which goes back to 1938. You can easily see the famous floods of 1947. A caveat is required, however. The Thames of the 1930s and 40s was very different from today; in other words, the flow was far less managed. 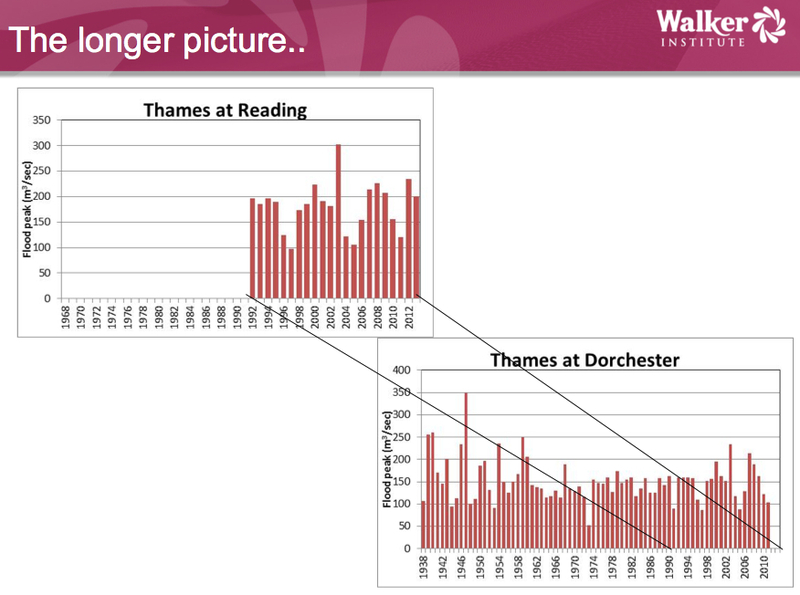 Accordingly, we are not really comparing like with like when we look at the Dorchester on Thames time series below—the present river is not really the same river as the past. 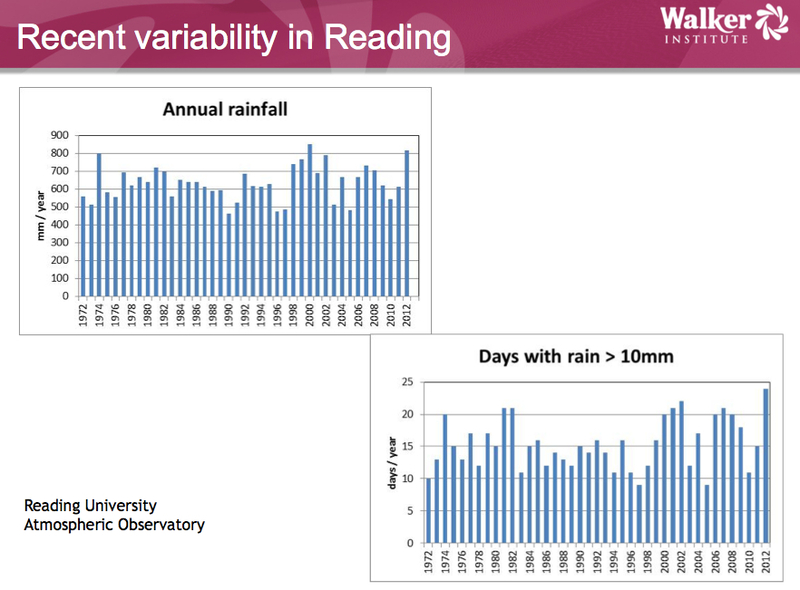 Rainfall may give a better feel for recent changes in climate, and the chart below shows rather tentative evidence of an uptick, mostly in the form of individual days with high rainfall. So we have a cluster of flooding events and also some very tentative evidence of climate change showing up in the annual record. How does this translate into the insurance companies perception of risk? The starting point is their loss record, which is a critical driver of premiums. And the big event in this respect is 2007, when the industry paid out £3 billion according to the ABI. By contrast, ABI saw pay-outs of £1.2 billion in 2012. The year 2007 led to the Pitt Review of the U.K.’s flood preparedness and subsequent implication of most of its recommendations. In 2009, the Environment Agency published its latest National Flood Risk Assessment (NaFRA) that forms the underpinning for the one-in-75 year flood risk demarcation point and is provided to the insurers. Actually, NaFRA has 37 categories of risk all the way out to one in 1,000 events. Rather strangely, while the critical risk number is one in 75, the flood maps open to access by the general public show only one-in-100 risk and one-in-1000 risk areas. An example of the flood map of my home town of Henley is below (you can access the map for any area in the U.K. here). Dark blue is one in 100 and light blue/green is one in 1000 (note that for coastal areas, the dark blue area relates to a one in 200 flood risk). 1. They only relate to river, lake and sea-related flooding (fluvial flooding), not surface and groundwater related flooding (pluvial flooding). Also note the sea related risk numbers are different from the river ones on the maps. 2. The degree of detail only goes down to a scale of 1:10,000 and is searchable by postcode only, not by property. 3. The map doesn’t show depth of flooding, a key determinant of damage. 4. The map assumes that flood defences will work, and in 2007 many didn’t. But let us start by assuming these NaFRA maps give a good assessment of risk. Then how many homes are we talking about (click for larger image)? Low risk covers approximately 1.2 million homes, moderate around 900,000 and significant risk 330,000 (sea and river-related flooding). Moreover, another 3.8 million homes are at risk of surface water flooding according to the Environment Agency. 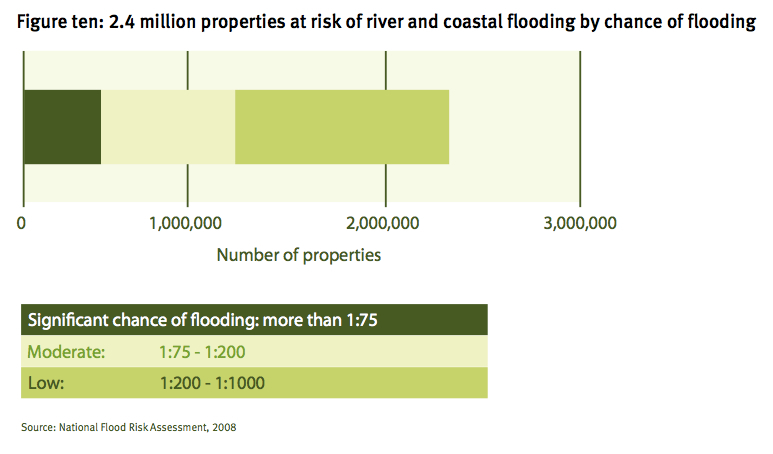 As one million homes are exposed to both fluvial and pluvial, the grand total of homes at risk is 5.2 million, or one in six homes in England. Scotland and Wales add a few hundred thousand more homes. 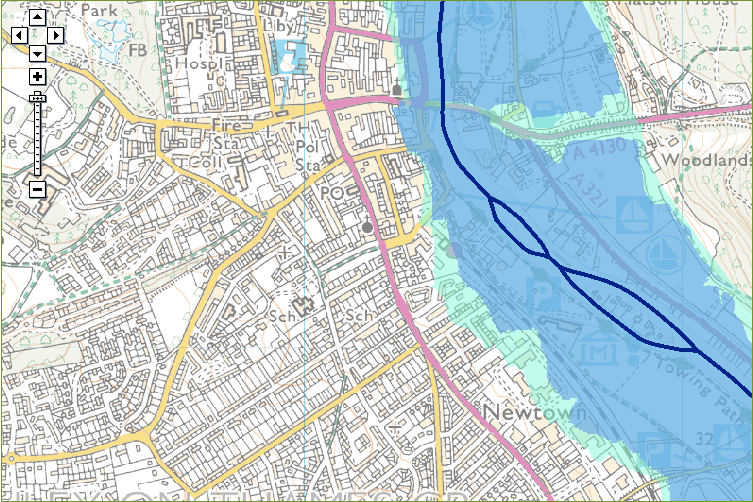 The likelihood of flooding has been calculated using predicted water levels and taking the location, type and condition of any flood defences into account, whether or not they are currently shown on the Flood Map. NaFRA is an assessment of flood risk based on information last updated in 2008. It shows the likelihood and consequences of flooding that could happen now. It does consider climate changes that have already happened but it does not show how the risks will increase in the future due to climate change. However, we are planning to develop and use this method to determine how flood likelihood may change in the future with climate change. It is worth bearing in mind that the potential extent of an extreme flood shown on the Flood Map might in future become more ‘normal’ as a result of climate change. – Between 1.0 million and 2.9 million by the 2080s of which between 700,000 and 2.1 million are residential properties. These are huge numbers of homes at risk (and they are really a stab in the dark, to which theme I will return to in another post). Moreover, we have only been looking at one side of the risk equation through most of this post: probability. True risk is probability times effect. If there is a one in ten chance of your home flooding and each flooding event produces £50,000 of damage, then it is not surprising the insurance industry wants to hike your premiums, increase your excess—or, better still, not insure you at all. Against this background, we now have a merry dance between property owners, insurers and the government over who holds the risk. How realistic are the CCRA numbers above? Are they good enough numbers to base hard-nosed insurance decisions around? I will return to the theme of how much true risk is out there and who gets to hold it in part 2, 3 and 4 of this post. This entry was posted in Climate Change and tagged ABI, CCFA, Council of Mortgage Lenders, DEFRA, Environment Agency, flood risk, UK flood map. Bookmark the permalink.